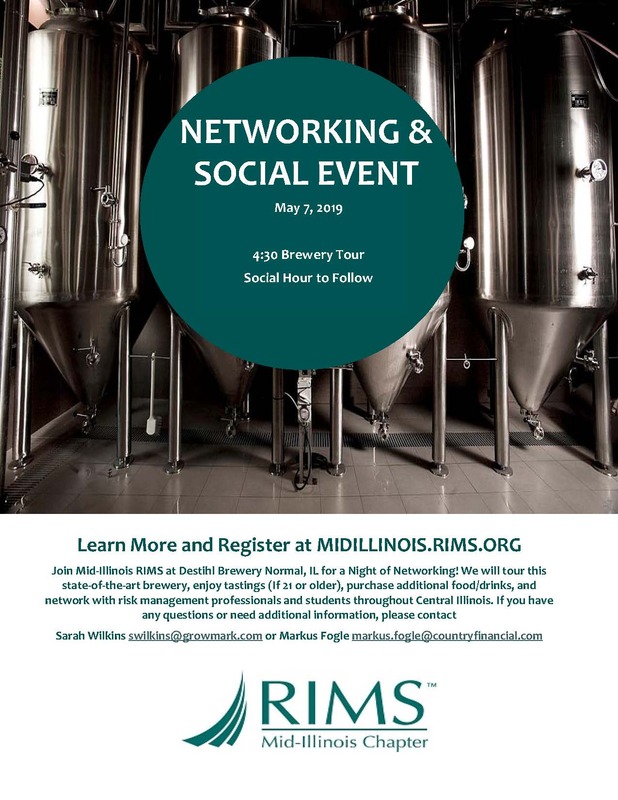 Tuesday, May 7, 2019 at 4:00 p.m.
Topic: The Mid-Illinois RIMS Chapter invites you to a social and networking event at our local Destihl Brewery. A Brewery tour is scheduled for 4:30 PM on May 7, 2019. Please join us for a tour of the state-of-the-art facility, networking with other risk management professionals and students and enjoy an opportunity to purchase additional food and drinks. Thank you and we hope you can attend! Each year, the Mid-Illinois Chapter of the Risk and Insurance Management Society (RIMS) selects a student pursuing undergraduate degrees in Risk Management, Insurance, or related fields to receive a $1,000.00 scholarship. Each candidate must be a full-time student, non-senior, and have at least a 3.00 GPA on a 4.00 scale. In addition, they submit a resume and written essay describing their future goals and plans upon graduation. As always, it was a very competitive field of candidates. The Mid-Illinois Chapter is proud to announce Katelynn Pankhurst as our 2019 Chapter Scholarship Recipient. Katelynn is currently a junior at Illinois State University pursuing a double major in Insurance/Risk Management and Finance. She is actively involved in organizations outside of the classroom such as Alpha Kappa Psi professional business fraternity, Business Week, and Gamma Iota Sigma international risk management, insurance, and actuarial science fraternity. Katelynn currently holds leadership positions as Risk Management Chair of Alpha Kappa Psi, and Director of Publicity of Gamma Iota Sigma in which she will also be the Vice Present of Internal Affairs next school year. Upon graduation, Katelynn plans to work as a commercial-lines underwriter where she will also pursue her CPCU designation. Congratulations to Katelynn. Her award will be presented at Illinois State University's, Katie School Student Recognition Dinner on Tuesday, April 9th. Copyright © MidIllinois. All rights reserved.